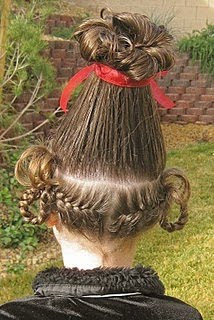 Can't think of something to do with your kid's hair for crazy hair day? Well, you've come to the right place. Here are several easy-cheesy ideas that will make your kid's hair the most creative! So it's spirit week at your kid's school and you have no ideas for Crazy Hair Day. Your kid, of course, desperately wants to have the coolest hair in school so here's some ideas to help you out! These are also great for Halloween and other crazy-cool events!!! For light hair: Just rub the chalk onto hair and apply a bit of hairspray to hold it in place. For dark hair: Mix a few drops of water with ground up/powdered chalk to make a thick paste. Apply the paste to hair and allow to sit for 30 minutes. Then blow dry hair on coolest & lowest setting, after which applying hairspray. The color should wash out after one or two washings. 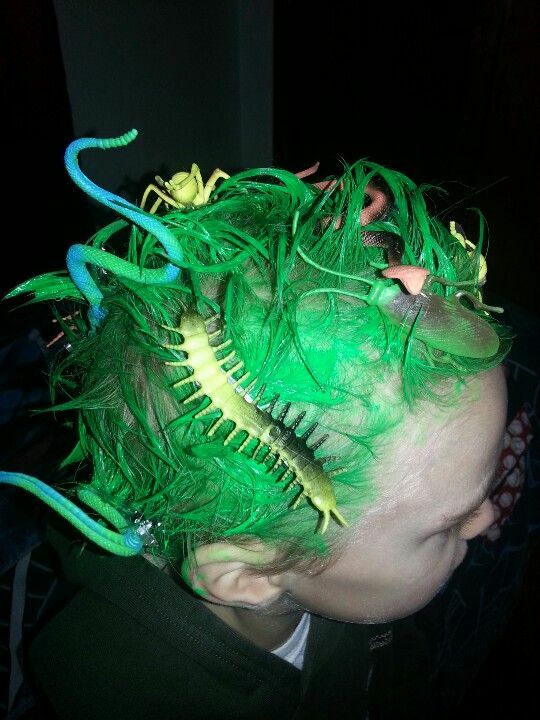 Just color hair green and bobby pin/gel in toy insects, snakes, and lizards for a jungle-esque look! Just put hair into two (or one) ponytails and then punch a hole in the middle of a cupcake liner. Pull the ponytail through the hole and form into a bun that fills the space of the cupcake liner. Hot glue a red pom-pom to the end of a bobby pin and pin it to the middle of the bun. Repeat on other side. Just braid hair into one or more braids and tie the string connected to a helium-filled balloon onto the end of it to create floating braids! Just put hair into a ponytail and clip all of your barrettes/hair clips in hair! For one option, braid hair into two or more braids and pin to head. Add toy snakes by pinning them to head as well. Or else, add the snakes as part of the braid. This is a bit trickier but results in a wavy braid and a look similar to Celia from Monster's Inc.
Just temporarily dye hair blue (see #1 for an easy option) and gel hair into a Mohawk. Pin or Gel in a toy Surfer (could also add fish, boat, or other nautical toys) to make hair into a Surfing Competition! Just braid or twist in several glow sticks and use pins, gel, or hair ties to make sure they stay in! For this look, just add a strand of ribbon to one(or more) section(s) of a braid and continue braiding! This can also be done with necklaces(For Christmas, try to find a necklace with mini lights or bells on it to braid in), fabric, shoelaces, and many other things! 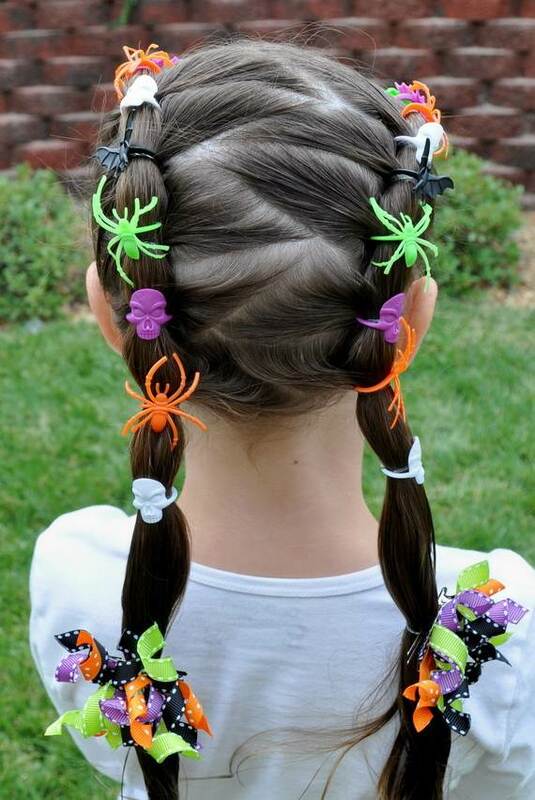 To do this, just pull hair through a ring (Halloween spider rings, or other cheap assorted plastic rings) and braid hair to secure, or secure with bobby pins. Braid hair into cornrows (or find someone who knows how) or else just braid hair into hundreds of little braids. Either way it looks awesome and stays in place for days! To make braids stand straight out/up, braid in a wire coat hanger (straightened, of course), pipe cleaner, or find some super-strong gel! Place a plastic cup on top of head and gather hair up around it, placing a ponytail on top of the cup. Use gel and hairspray to position hair and secure it better. Add loopy braids at bottom if wanted.